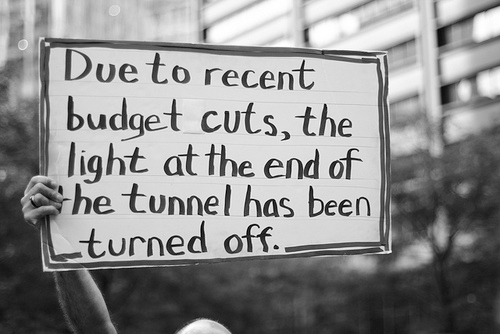 This is not to suggest that utopia or the light at the end of the tunnel is some kind of a reachable thing. It functions more so as a psychological bait for us more so than any concept of reality, but this is relevant nonetheless. A demonstrator uses a video camera as he stands in a cloud of tear gas fired by police at the Occupy Oakland demonstration. 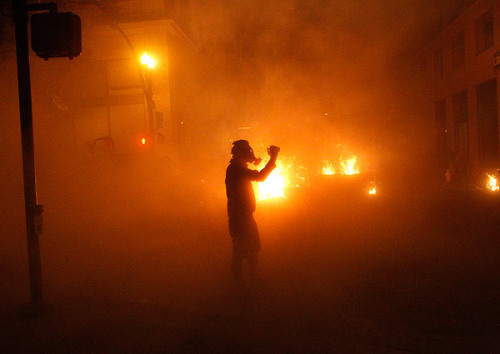 Police in riot gear clashed with protesters in Oakland in the early morning hours on Thursday, firing tear gas to disperse demonstrators lingering in the streets after a day of mostly peaceful rallies. Although the ban against any sort of amplification may have been set into administrative law as of November 1st, Free Speech Friday from noon to four went on just as planned. Accessorized with two megaphones, a handful of speakers and a bucket of chalk, the event commenced and carried on until the sun disappeared behind brick and mortar without a single disruption from police or administration. Free speech is only free when it is equally as free at 100 decibels as it is at one. Free Speech Friday indefinitely serves as a component that has long since gone missing in the industrialized, technology-oriented communicative methods of today. For although we move toward the creation of a “global brain” through which world wide, fast-paced internet unites us as one social conscience it is important to establish local communication that addresses both local and global issues. One can only hope that those that flippantly walk by are participating in the “global brain” with their computer and phones in a way that articulates the sentiments displayed in the quad. Which is also note-worthy for the fact that information dissemination through the internet is perhaps MORE dangerous to maintaining obedience than real life vocalization. If one is to ban free speech done with one’s voice then one would also have to ban free speech through the internet for optimal effect and leveled legislative practices — both invade our private methodologies to interact in the public sphere. To any future disciplinary action banning speech in both auditory and virtual form, the very flesh of communication we could say, there would still remain the ideas in the private mind however absent in the public domain. It is only appropriate to utilize a quote as the fifth of November is now upon us. Coen Brother’s The Big Lebowski references, anyone? Don’t be The Dude, my friends.The nonchalant look only works in the movie. You’ve got rich old men messing with you on Wall Street, not paying you to find their wives. Whether we do or do not have a physical symbol of the occupation on campus isn’t the most important part of the movement. 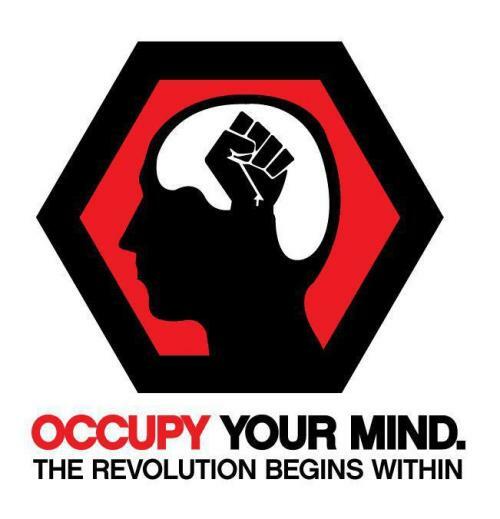 May I be so bold as to impose a dualism on the occupation and suggest the mind to be the more important space to occupy? Yes, I would be so bold. Take the time to visit our virtual library or stop by Bennett’s tent to pick up some hand-outs and chat about ideas. 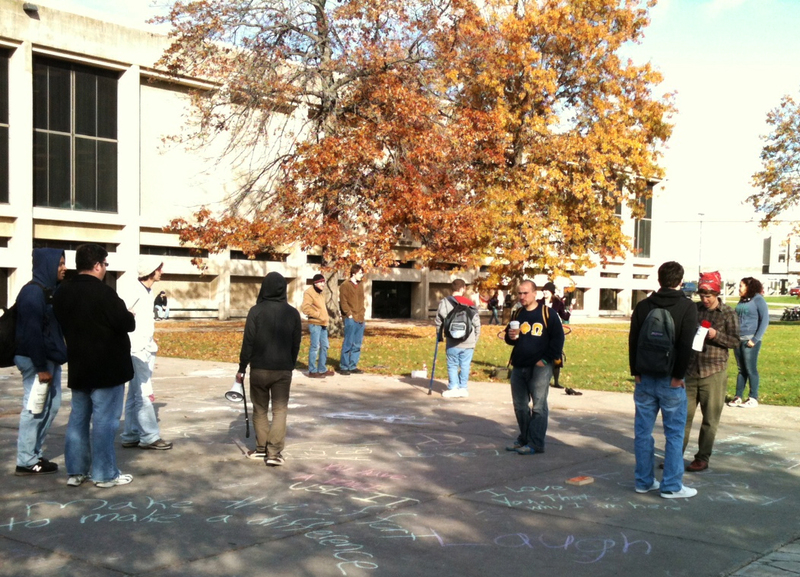 Not to stray too far from the central topic at hand, Halloween was a day of some transitional stages in the Occupy Oswego set-up on campus. The occupation has certainly not ended, to comfort to worries of all those that believed it to have fizzled into oblivion: it has simply re-adjusted itself. 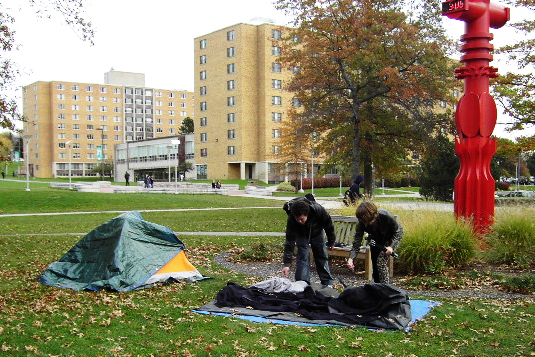 The original tents were destroyed by a combination of rain and (confirmed rumors have informed me) a fellow destroying them in a drunken 2 AM rampage on campus. 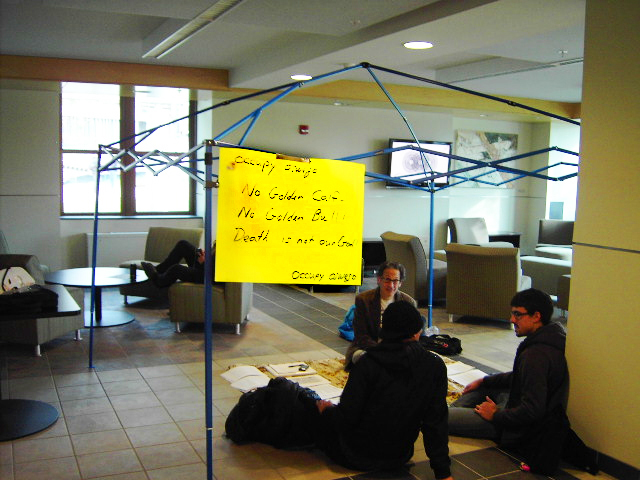 By mid-afternoon, Oswegonian occupyers were seen taking them down with sullen faces, but they assured me that there was another occupation in Campus Center. Off I went to check that out. 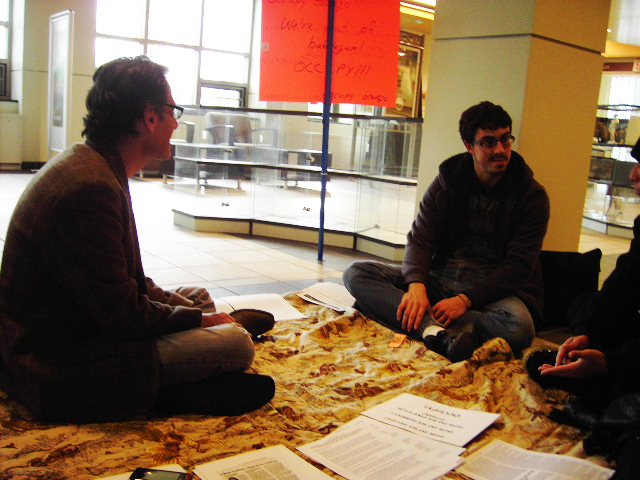 Indeed, after you pass the “Why Occupy?” table in the main vein of the building and ascend to the lounge, Head of the English Department Bennett Schaber can be found cross-legged and smiling beneath a tent construction amongst a plethora of chatting students and piles of hand-outs every Monday, Wednesday and Friday. “Hey, hey! A Guy Fawke mask… That’s what I’m talking about!” he shouted as I scurried past. I crouched down to meet him and his miniature library of Occupy literature that includes many different writings: the transcript of the speech Slavoj Žižek gave in Zuccotti Park, – “We are not the dreamers. We are awakening from a dream which is turning into a nightmare” – copies of the rights to free speech on campus, – “The College retains the right to determine the time, place and manner of assembly or presentation to assure the continuity and quality of the educational process in and out of class, the safety of the individuals, and the protection of property” – a wonderful piece by David Harvey, – “Many decent people are locked into the embrace of a system that is rotten to the core” – an article by Naomi Klein in The Nation, – “No. We will not pay for your crisis” – amongst a variety of at least a dozen hand-outs that will, shall we say, occupy your mind. After snapping up one of each I told him with a breathy sigh, “You are such a hippy.” He turned to the graduate student beside him and laughed. “At least I have one fan,” Schaber said. He seems to have many fans, in fact, with an email list quickly growing and frequent visitors, despite the hoards that simply walk past. “They don’t even stop to read the sign,” he complained. But he also has opponents, having been called down twice to face administrative whiplash. “I’m constitutional!” he exclaimed, “I’m not moving! They told me ‘lawyers have probably looked at this,’ I said, ‘Yeah, they probably look at everything… Let us set up what we’ll be doing and then decide how you are going to react.” He also suggested, “Let’s have a General Assembly and invite the police and administration so we can figure it out.” Until then, he’ll be happily stationed with his political roots settling themselves nicely in the upper campus lounge. As administrative fears of a lack of control are ascending into the hierarchical consciousness they seem unable to build themselves on fair ground and can be seen raising superfluous branches to cover and protect their weakness. Let us not allow their tree to swallow the towering structure of our tents, whether they be in the physical world or in the mind. As the legislative resistance comes head to head with our resistance, may we shake them from their hierarchical branches with our strength in numbers and mind and witness them stripped of the authority and official titles that had supported them previously. With all false façades and justifications gone, may we watch them retreat into visions of the dominance they fractured their minds to obtain and shout orders into the empty air. Across the semi-hipster, semi-political schizophrenic wallpaper that is the Tumblr blogosphere this picture can be found to have been re-blogged 203 times and counting. The lack of a message is decidedly a blaring concern. What ARE we saying if anything? 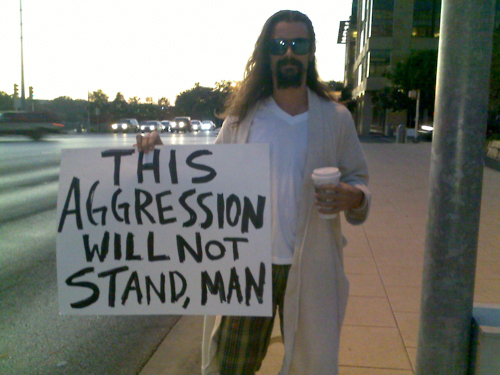 What ARE we beyond a sign-carrying, street-occupying huddle whose long bubbling anger has only now shown itself with the intensity of a gaggle of psychotic jack rabbits tamed by a determined rationality for peaceful, observed, civil public discourse and concern? Who IS being demanded to fix everything and who IS the problem? Let us carefully look at the power relationships present in the picture. What precisely are we proposing as the solution and how do we get there? Let’s not contradict ourselves, let’s focus the message in this melting pot of ideologies. We have strength in numbers, but in message we lose grip. There have been a list of demands by some, commentary by public figures we may call “intellectuals,” but I have yet to see a collective agreement on what we are saying. Let us not elevate this responsibility up to those supposedly “higher” than us in the intellectual landscape, let us decide together less we remain a single mass with conflicting ideas. 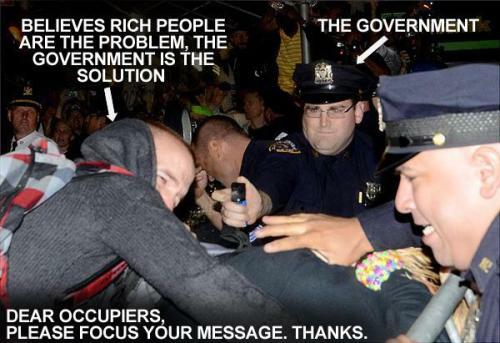 I am all for support, but I suggest we all stop to ask ourselves, what ARE we saying, occupyers?